DONETSK, Ukraine -- Leaders of the pro-Russia separatists in eastern Ukraine vowed in a rare joint appearance Thursday to turn their biggest remaining stronghold into a final battleground as government forces edged closer. Ukrainian officials said they had regained control of the rebel-held town of Siversk, and were moving to consolidate their position by funneling aid into recaptured areas and repairing damaged infrastructure there. Rebel leaders in the regional capital of Donetsk said that they had decided to surrender Siversk to avoid being surrounded there. The government appeared to gain the upper hand in the three-month-old fight when it forced rebels to retreat last weekend to Donetsk from their former stronghold of Slavyansk. Siversk, with about 10,000 people, was the last in a ring of cities around Slavyansk to fall. Civilians stuck in the conflict zones have had to cope with increasing disruptions to basic services as the fighting damaged infrastructure and cut off government services. Speaking in the occupied government headquarters in Donetsk, Alexander Borodai, the separatists' prime minister, and their military commander, who goes by the name Igor Strelkov, struck a defiant tone. The two men, both Russian citizens, also said they were counting on Russian help, and warned frightened residents of the city of nearly 1 million of a looming evacuation. "We can concentrate our forces in one place, and inflict greater damages on the enemy, and we can seriously prepare for the defense of this city, for an active defense, to put it mildly," said Mr. Borodai, who had until recently worked as a consultant in Moscow. On Thursday, insurgents attacked Ukrainian forces stationed near the closed Donetsk airport, but didn't seize control. The mayor of Donetsk, who has sought to keep the city running by avoiding taking sides, confirmed the fighting near the airport, which has been closed since a major clash there in May. Officials in the capital Kiev have said they are aiming to surround Donetsk to force the rebels out, and would seek to avoid street battles. Few Ukrainian troops have urban fighting experience. Around 100,000 residents have left since April, the mayor has said. Borodai said they were planning the possible evacuation of tens of thousands more. Russia has so far ignored calls by the rebels to send in troops, but Ukraine continues to accuse Moscow of funneling arms and fighters to the separatists through the porous border. The separatist movement here has been at pains to position itself as a grass-roots campaign of local ethnic Russians who fear a surge of Ukrainian nationalism in the wake of the toppling of a pro-Russian government in Kiev last February. Yet the presence of two Muscovites at the movement's helm has led to accusations from Kiev and Western capitals that the Kremlin is pulling the strings behind the scenes. Strelkov, a former Russian military officer whose real name is Igor Girkin, and Borodai both played a role in Russia's annexation of Crimea. But the two old friends said they are merely volunteers in Donetsk. 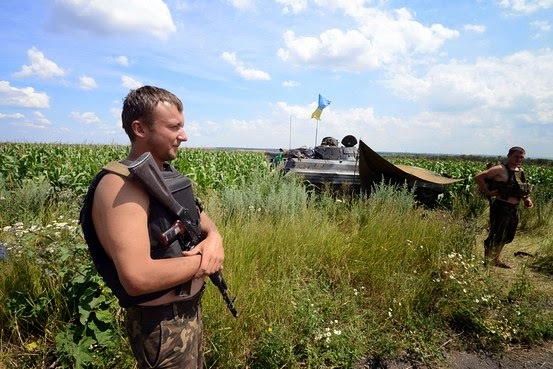 The people of Donbas, as the wider region is known, "rose up on their own," Borodai said. "The fact that because of certain competences, qualities and capabilities, we both happened to lead this movement, well, it just happened that way." Strelkov, wearing a vintage wooden holster on his belt, said the retreat from Slavyansk and two other small towns allowed the insurgents to conserve resources and manpower for the battle of Donetsk. "Unfortunately, we couldn't have kept those resources otherwise," he said. The government in Kiev said it was moving to restore heavily damaged water and electricity supplies to Slavyansk, which had a population of more than 100,000. It also said it was sending nearly 25 tons of humanitarian aid and resuming pension payments for residents immediately. Local officials said they were moving to restore train service between Slavyansk and the nearest major government-held city, Kharkiv. Demolition experts were clearing roads around the town and had neutralized a ton of explosives, including a dozen improvised explosive devices and 20 antitank and anti-personnel mines, the defense ministry said. The Ukrainian defense ministry reported several battles overnight near Donetsk and Luhansk—the other main city held by the rebels—as well as a around a handful of other rebel strongholds. The ministry said three soldiers were killed and 27 wounded, bringing the total on the government side to 173 killed and 446 wounded since the fighting began in April. Officials in Luhansk reported that six civilians were injured in fighting around that regional capital. The State Border Service said the hotly contested border checkpoint of Dozhansky had been hit by more than 200 mortar shells over two days, completely destroying it, although it remained in government hands. The service said three other border posts also came under fire overnight. Borodai, just back from a trip to Moscow, said he'd held "rather successful political consultations" there, though he refused to say with whom. He said the separatist movement is oriented toward Russia, "spiritually even. And we await the arrival of Moscow, in a good sense of the word, we crave it, and pray for it," he said. "So any people from Moscow are welcomed here." He then introduced a new internal-security chief: Vladimir Antufeyev, a Russian citizen who had once held a similar job in Transnistria, the self-styled breakaway republic carved out of Moldova with Russian support in the early 1990s. He said he had fought Transnistria, in the Serbian part of Bosnia and in Chechnya. He said he resigned last year from Russia's state-security service with the rank of colonel. Ukrainian intelligence maintains he is still a serving Russian military-intelligence officer, the claim denied by Moscow. The two Muscovites also said that Donetsk's popular, three-term mayor should pledge allegiance to the rebel cause or step down. The two men, who first met in 1996 in Moscow, dismissed the idea of negotiations with Kiev and promised there will be no retreat from Donetsk. In Russia, a court extended until the end of August the detention of a Ukrainian air force pilot charged with being an accessory in the June deaths of two Russian journalists. Russia's Investigative Committee has accused Lt. Nadiya Savchenko of transmitting the location of the journalists and others to Ukrainian ground forces who then fired mortars at their position, killing the reporters and two others. How Lt. Savchenko ended up in Russian hands is in dispute. Russian officials say she was arrested after crossing into Russia as a refugee with no documents. It was later determined she was on a wanted list and she was arrested on July 2, Russia says. But Ukrainian officials say she was abducted from her base and forcibly taken to Russia. Russia's pro-Kremlin TV channel NTV reported on June 20 that she was captured by rebels and then handed over to Russian authorities.